At least 121 children living around a battery factory in eastern China are suffering from lead poisoning, according to officials. By Malcolm Moore in Shanghai Source: The Telegraph (UK), 27 Sep 2009 The scandal is the latest in a string of heavy metal poisoning cases caused by lax regulation at Chinese factories. Increasing public anger over the nation’s blighted countryside has forced China’s leaders to tighten environmental standards and may yet pressure Beijing into a more proactive stance at the United Nations climate change talks in Copenhagen at the end of the year. According to the local government, doctors tested almost 300 children under the age of 14 in Shanghang county, Fujian province, and found 121 of them to show signs of lead poisoning. An investigation has begun, officials said. 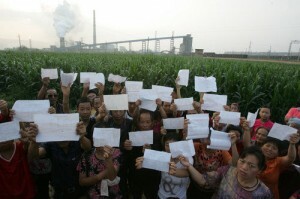 The children lived close to the Huaqiang Battery Plant, which was shut ten days ago after villagers approached the authorities with test results showing that some residents had been poisoned. “I hope the factory will be shut down forever, otherwise I am planning to move out,” said a woman surnamed Yuan who lives within half a mile of the factory. Her 11-year-old son tested positive for lead poisoning. “I’m very worried about my child and hope the government can work out a plan to help the children expel the lead from their blood,” she said. Lead is particularly toxic to children and can interfere with the heart, stomach, kidneys, reproductive and nervous systems. It also causes learning and behavioural disorders that can be irreversible. Several clusters of lead poisoning have emerged in recent weeks in an indictment of the Chinese government’s failure to develop health tests for the long-term build-up of heavy metals. Decades of breakneck industrial development have left many regions polluted with chemicals and heavy metals. At the end of August, over 1,300 children in Hunan province who lived around a manganese factory were diagnosed with lead poisoning. The manganese plant reportedly opened in May 2008 without the approval of the local environmental protection bureau and within a third-of a mile of a primary school and a kindergarten. In a separate case in the northern province of Shanxi last month, 615 children tested positive for poisoning from a nearby smelter, which was eventually shut down after protests.